The worlds of tabletop role-playing adventure and Nintendo Switch collide in an amazing new game from Tin Man Games—The Warlock of Firetop Mountain: Goblin Scourge Edition. The game arrived on the Switch Sep. 13 and I haven’t been able to put it down since. I grew up with the original Fighting Fantasy novels, played the SNES version of Deathtrap Dungeon and ran several Dungeons & Dragons games over the years. So, when I heard this game was going to release on the Switch I knew I had to check it out! From the beginning, I found myself immersed in the story, complete with D&D style graphics and text adventure. Players start the game with a brief primer about the quest—there’s an evil warlock called Zagor, holed up in his mountain. The adventurer must stop him! Or something along those lines. In the book, you were the adventurer. In this game, you have some options. Several characters, each with their own backstory, combat maneuvers, and unique plot points are available at the start, with additional characters added throughout the game. Each character is represented as a detailed tabletop miniature, evoking a true tabletop feel. During combat, enemies—also represented by detailed miniatures—move as if on a grid through the non-battle parts of the adventure. Each miniature has its own info sheet explaining various moves and abilities. In a fantastic touch of realism, the minis appear with slightly dingy paint jobs, almost as if they’re well-used on the table. For my first playthrough, I chose a character called Blacksand. Tasked with tracking down the Eye of the Cyclops and giving it to Zagor, she enters the mountain. In fact, each character has a side quest like this (the second character I took through the game was trying to find a goblin jailer, and the third seeking to prove his worth in battle ) and it works well to create a unique experience each time you play the game. Each character experiences the adventure differently as well. For instance, Blacksand possesses an excellent education and can easily read any text she comes across. Other characters may not understand the text, but can intimidate foes. During combat, there’s an actual combat grid and a smaller space in which to fight. You move your mini appropriately and choose from a variety of attacks. When attacking an enemy directly, you “clash” with it, resulting in a dice roll. This is a nice touch and throwback to the original books, where as you read, you’d be required to roll dice to determine the outcome of a battle. The dice mechanic allows a re-roll if you hit the button fast enough, but it doesn’t always work in the player’s favor. Combat works the exact same way in the game. Instead of Hit Points, you have Stamina. Take too much damage and you’re dead. Unfortunately, enemies tend to deal quite a bit of damage and the only ways to restore stamina are to eat some of your limited provisions or find a bench and rest. Even then, it doesn’t restore stamina fully. When the character dies, you can use a “resurrection stone” to resume from the last checkpoint. However, these are limited and when they’re gone, so are you. It’s a great way to make the game a bit more fun and fair. In the books, the reader can simply bookmark the page and return to it if they find an outcome they’re dissatisfied with. That won’t happen here and there’s no character sheet or dice roll fudging either. The game play and control is quite intuitive. It’s part RPG, part choose your own adventure story. As you wander through the world the paths branch. As you choose a path, a graphical representation of the area is built in front of you. The locations are typical dungeon fair, running the gamut from stone corridors to rivers to crypts and towers. Graphics are rendered well and everything looks like what it’s supposed to represent. By building the setting in a modular style, the game stays true to its tabletop roots. The music is ambient and unremarkable, but definitely fits the overall aesthetic. It’s not terribly memorable, but would be right at home playing in the background of an actual tabletop game. Considering this, the audio is ideal for this game’s purpose. The difficulty level here is surprisingly high. If you’re not careful, your character will die a quick and horrible death. Combat is a bit of a learning curve, but once you get the hang of it you should be fine. There’s a plethora of extras, including a brief history of the book and timeline of the Fighting Fantasy book series. This release also contains all of the DLC from previous iterations of the game and offers the ability to play as a few of Zagor’s minions as an alternative to always being the hero. Playing through the main story is just as fun and satisfying as it was when I first read the book back in the ‘80s. The addition of a “gauntlet” mode containing a series of fast-paced battles is a nice touch and all of the Fighting Fantasy history will make this a game to replay several times over. At $29.99 this is a great value for anyone just jumping into RPGs, fans of the Fighting Fantasy series or anyone looking for an action-packed, story-driven challenge. 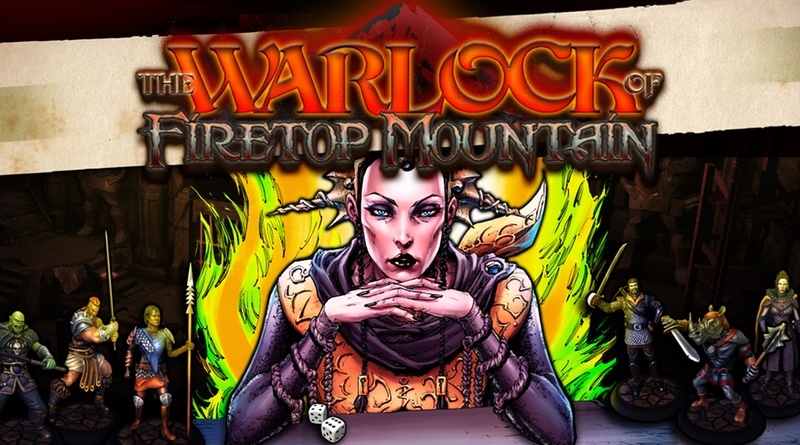 Warlock of Firetop Mountain is a fun, challenging RPG with a twist. Whether you’re a fan of traditional RPGs, read the books as a kid or have no history with the series whatsoever, the game will draw you into the adventure. The variety of player options will keep you returning to the mountain for a long time to come.